← ATP Finals Preview: Reservation For Eight, Please. Federer and Nadal’s “Blue Chip” Status on the Auction Block. It’s been fun over the course of the last few months to watch the eight players who qualified for the Barclays ATP World Tour Finals celebrate their accomplishment by creating an original artwork bearing their likeness in colorful silhouette through a technique called airballing popularized by English cricket captain Michael Vaughan. This week each of the eight pieces will be auctioned off on Ebay with proceeds of each sale being split two charities: Save the Children and a charity of the player’s choice. 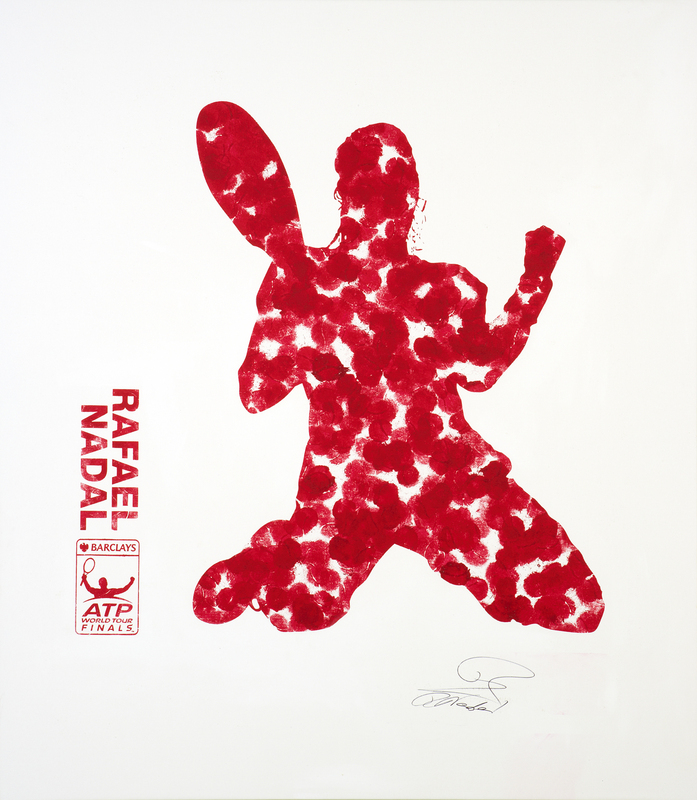 As Andy Warhol once said, or at least had attributed to him, “Art is what you can get away with.” And though it’s no surprise that the creations of Roger Federer and Rafael Nadal have already collected bids of over $12,000 US in just their first day on the virtual auction block, one wonders if the final bid earned by each of the players this week in London could portend their future success next year. Like any art auction, potential buyers are faced with work by three types of artists more or less – emerging, mid-career and the “blue chip” artists that even those who’ve never stepped foot in a museum have heard of. And though all the guys playing in London this week have been on the tour for many years now, some have found themselves in hot demand which isn’t that different from an artist who’s been tolling in obscurity for years and then suddenly finds his or her work being eagerly sought out by everyone. Take Robin Soderling for example. Two years ago he was just considered a talented yet unproven player who many expected to remain stuck in the top 50 for the remainder of his career. But after his surprise win over Nadal at Roland Garros in 2009, Soderling has rocketed to No. 4 in the world in just over 18 months. Soderling, who many considered a legit threat to win London this week, has to be very pleased that his piece, which I like to call “Skipping Fist Shaker” fetched a decent $5,100 at the final gavel. I actually think that whoever placed the final bid got a steal as Soderling can only improve and possibly win a Slam though some doubt that. 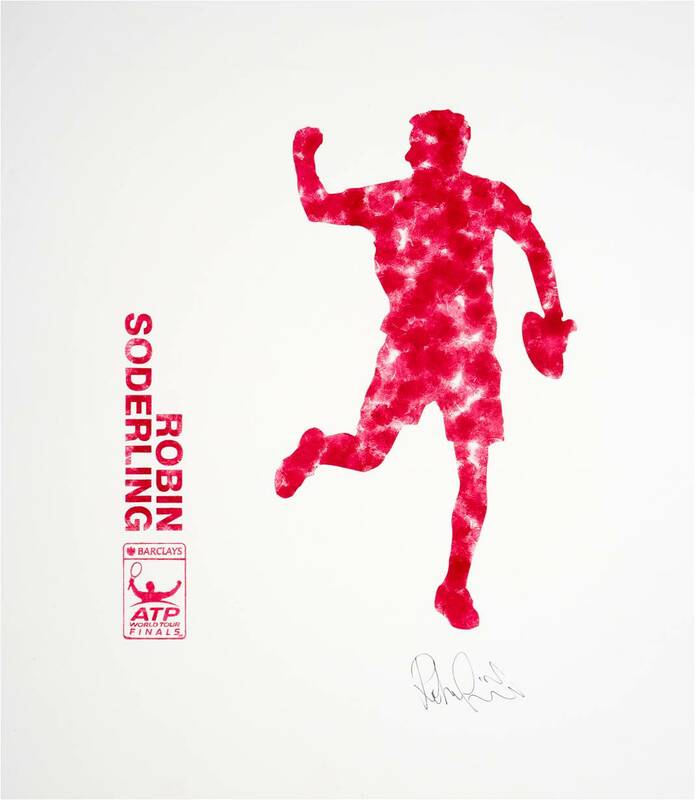 Whatever you think about Soderling’s prospects for 2011, his art debut proves he has many fans, even if he still has a reputation as the tour’s “most hated” player. The piece I’m keeping an eye on is Andy Roddick’s last minute addition to the auction. Painted in a dark teal, the piece shows Roddick’s now classic knee bend service motion even though the racquet in his hand looks more like a frying pan than his trusty Babalot. So how will Roddick’s “Ace in Motion” do on the market? It’s hard to tell. Roddick, despite now qualifying for the ATP Finals an impressive eighth year now, is for many still a disappointment in terms of him only winning one Slam title. So leaving aside that he was just “unlucky” being in the Federer and now Nadal era’s, whoever finally picks up Roddick’s creation would have to be a diehard Roddick fan, one who has stayed loyal despite the roller coaster of hype, missed opportunities and yet true consistency that Roddick’s earned through his career. Which is why I expect Roddick’s piece to close out just shy of five figures. Yes I said five figures. And since Federer’s “GOAT in Flight” and Nadal’s “Roaring Vamos”, appropriately shaded in blood red, raced past that mark in a few hours with nine days to go there’s no reason that both pieces couldn’t be at the $50,000 mark by the final days of the event. Or even higher. In fact if Federer’s work doesn’t close out or get close to $100,000 by next Sunday, I would consider it a disappointment for the auction. After all this is the “GOAT” we’re talking about here. Am I wrong to throw out such numbers? Not really. It doesn’t take an M.A. in Art History to realize both Federer’s and Nadal’s “blue chip” status and since these works are one of a kind creations by two now legends of the sport, it wouldn’t surprise me if the final bid doesn’t come from a wealthy fan of either player (via an anonymous telephone call of course) but a savvy dealer in one of a kind sports memorabilia who knows they could sell each piece years from now for double what they paid for it. And though reselling an artwork made of charity would be considered bad taste, it’s not like reselling doesn’t happen with more frequency on the regular art market. But should we really judge a player simply because of how well their creation fetches this week? I could go into more detail on how Andy Murray’s piece will be overvalued while Novak Djokovic’s will be the steal of the auction. As far as Tomas Berdych and David Ferrer’s works? Well they could be for those who take the long view. Thankfully for all of the men playing next week, they can let their tennis have the final say rather than the capricious whims of an art market that will bear anything, so long as you are ready to write a check. 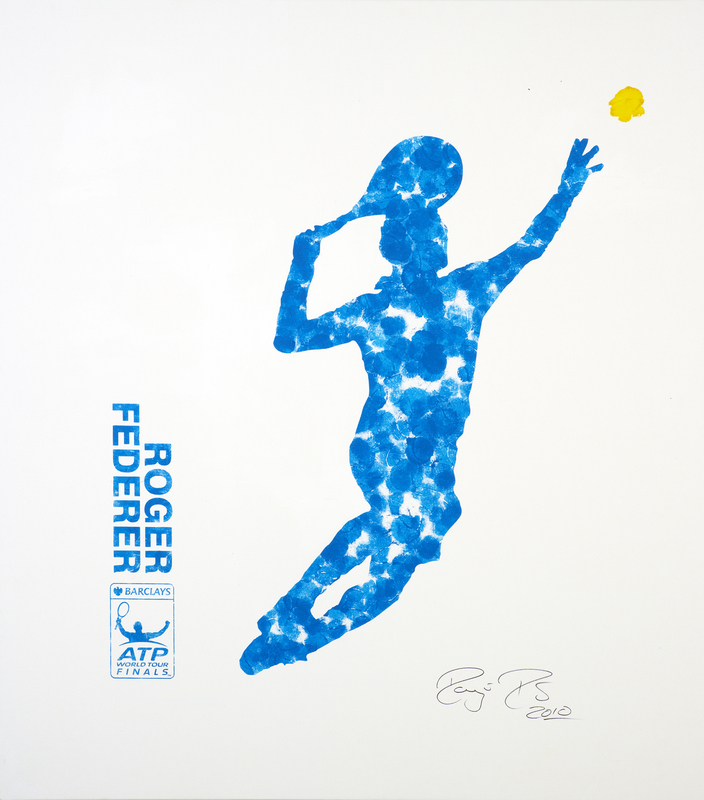 To learn more about “The Art of Tennis” ATP Charity Auction, click here. To learn more about airballing, click here. Interesting post — what a great auction!